Thomas STRONG (1584 – 1663) was Alex’s 10th Great Grandfather; one of 2,048 in this generation of the Miller line. Thomas Strong was born in 1584 in Chardstock, Devon, England. His parents were George STRONG and [__?__]. He married Joanna BAGGE 12 May 1604 in Chardstock, Devon, England. Thomas died 12 May 1663, Chardstock, Devon, England. Joanna Bagge Joanna died 26 Aug. 1657 in Chardstock, Devon, England. 1636 in Dorchester, Mass 6 Sep 1675 in Northampton Mass and is also buried at the Bridge Street Cemetery in Northampton. A daughter bur. 10 June 1609, Chardstock, Devon, Eng., probably one of the above, since three daughters mentioned in the will of John Stronge, 1612. Thomas lived in George Strong’s cottage which was built in the late 1500s, likely for Strongs who later moved to Chard (about 4 miles away). The Strong Cottage was built by the Chardstock Manor Estates. The current Lord of the Manor is Jonathan Milford who lives in Manor Home in Chardstock. 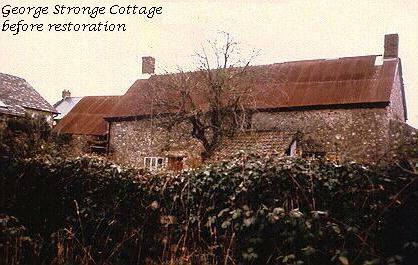 The Strong Cottage was rehabilitated around 1993. Jarvis Strong’s project to help the rehab provided $10,000, which was a bit less than 10% of the total. It did indicate American interest in the project, though, and provided the impetus for the owners to complete the cottage rehab. 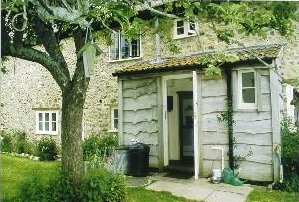 The cottage is presently rented by Joe Harrison as his home. Check the Strong Family of America website for details on how you can visit. Jane’s first husband John Hopkins was born in 1614 in London, England. His parents were Stephen Hopkins (1581 – 1644) and Constance Dudley (1580 – 1610). John died 14 Apr 1654 in Hartford, Hartford, CT.
Jane’s second husband Nathaniel Ward was born in 1604 in Little Wratting, Suffolk, England. His parents were Edward Ward (1560 – 1620) and Judith Lukin (1570 – 1627). Nathaniel died 1664 in Northampton, Hampshire, Mass. Nathaniel was an original proprietor of Hartford, Connecticut in 1638. They moved to Hadley, Mass in 1659. Jane’s third husband Gregory Wolterton was born 1593 in Heigham, Norfolk, England. His parents were Richard Wolterton (b. 1550, d. before 8 Jan 1617/18) and Mary Bensley. He first married Susannah Shepard (b. 1587 in Wherstead, Suffolk, England – d. 1662 in Hartford, Hartford, CT). About 1663 he married Bennet (Tritton) Stanley, widow of Thomas Stanley of Hartford and Hadley. Bennet was baptized at Ashford, Kent, 30 July 1609, and died Jan. l664/65 aged 55. He married third, perhaps in 1667, Hannah (Thurston) Lord, widow of Thomas Lord (Jr.) who had died in Wethersfield in 1662. She was a young woman with small children, the three Lord girls whom Gregory remembered in his will. Jane was his fourth and final wife. Gregory died 14 Jul 1674 in Hartford, Hartford, CT.
Gregory Wolterton, Wilterton, Walterton, Winterton, —the surname is spelled in countless ways—was an original early settler of Hartford, Conn., a tanner, and a man of good estate. He left no children, although he is known to have married at least four times. His will has been a puzzle to genealogists because it makes bequests to a large number of people. It can be shown that some of these were children of his second, third, and fourth wives; most of the others were presumably relatives of his own. Unfortunately, he fails to specify how any of his legatees were related to or connected with him, and in the past all kinds of theories have been advanced, some correct, some incorrect, to explain, to at least in part, the relationships involved. to draw proper conclusions. Muffy Moore MaryM6@aol.com..5/27/98 1:55:47 PM, . WOLTERTON has never been a *proven* surname for Nathaniel MERRILL’s wife. It was *guessed* when after Nathaniel’s death, young John went to Hartford to live with Gregory WOLTERTON. As Gregory was a wealthy, childless man, what young widow wouldn’t send her son, when invited, to CT – to apprentice to a rich man?… young John became the adopted son of Gregory WOLTERTON and a rich man himself when Gregory died and left him his fortune! Gregory had 4 wives: 1) Susanna ( ) who died Hartford 1662 age 75, having had no children. Then a series of widows 2) Benet (TRITTON) STANLEY, widow of Thomas STANLEY, who d. Jan 1664/5; 3) Hannah (THURSTON) LORD, widow of Thomas LORD, who d. c. 1669, having given birth to one son Samuel WOLTERTON who died at age 7 months; and finally, 4) Jane ( ) (HOPKINS) WARD, widow of John HOPKINS and Nathaniel WARD, who survived Gregory and d. before 1679. In Gregory’s will, (transcribed in “Emily Angell”) he remembered Jane, several nieces and nephews in England, the LORD step-children, plus many other folks around CT. He made John MERRILL his executor and primary heir of the “tanyard” and all his “howsing” and remainder of his large estate. There is no indication now that Susannah ( ), widow of immigrant Nathaniel MERRILL was any blood relation to Gregory WOLTERTON. Invt. £585-16-00. Taken 6 August, 1674, by Thomas Bull and Thomas Bunce. Will dated 17 July, 1674. I Gregory Wolterton of Hartford, upon the river of Conictticote, doe make this my Last will and testiment, wherein I give unto my wife Jane Wolterton the some of twenty pound to be payd in moveable goods as is prised, provided that it be in such as she desire. I doe also give unto Jane my wife her dwelling, and liberty and use of the newe rooms which was last bilt, which is next to the garden, but not for to let it away to any but for to use it for her owne use during the Terme of her life, and for to use some part of the seller and the ( ) for her Convenientcy, and liberty for her to set her fire wood in the yard. I doe also give unto her Six pound, to be payd to her by the yeare by my Executor, during the Time of her life. Some genealogies say that Sarah married [__?__] Mathews and had two children, both alive in 1694: James Matthews and Jeremy Matthews. James first married [Katherine] Minterne, niece of the equestrian family of Heown of Frampton, and had by her a son, Melakcthon. By a 2nd wife he had further issue, and particularly Martin,born in 1663, thirty years vicar of Yeovil, who married a dau. of Phelips of Mont acute, and left issue. The Battle of Sedgemoor was fought on 6 July 1685 and took place at Westonzoyland near Bridgwater in Somerset, England. It was the final battle of the Monmouth Rebellion and followed a series of skirmishes around south west England between the forces of James Scott, 1st Duke of Monmouth and the crown he was trying to take. The royalist forces prevailed and about 500 troops captured. Monmouth escaped from the battlefield but was later captured and taken to London for trial and execution. Many of Monmouth’s supporters were tried during the Bloody Assizes. Many were transported abroad, while others were executed by drawing and quartering. Rev. John Pitt, Vicar of Chardstock (1627-1645), Warden of Wadham College, Oxford befriended James Stronge “a poor tailor of Chardstock who wrought for a groat a day, his pottage and bread and cheese”. Rev. Pitt sent him to New Inn College, Oxford. In 1645, James returned to Chardstock and turned his mentor out of the vicarage and carried off his books and goods to his own living. JOHN PITT – (1627 – 1645) – Son of Robert Pitt of Isle Abbotts who leased land from Nicholas Wadham of Merrifield. – 1644 became Warden of Wadham College, Oxford, founded by Dorothy Wadham, widow of Nicholas Wadham in 1613. He also became the leader of the dissident heads of houses who denied the authority of the Parliamentary Commissioners during the Civil War. [So John and James were on opposite sides during the English Civil War. ] – 1636 sent James Strong to New Inn College Oxford who in return in 1645 turned John Pitt out of his living in Chard, who “carried off his books and goods to his own living in Bettiscombe.” – 1648 – dispossesed of the Wardenship. “Calumny Revised ” by A.G. Matthews, M.A. Printed by Clarendon Press. James Strong, Vicar of Ilminster, Somerset, admitted July 24, 1654. The sequestrated vicar restored. Vicar of Curry Rivel with Earnshill, June 6, 1686, son of Thomas Strong of Chardstock, Dorset, New Inn Hall, Oxford, Matriculated April 8, 1636, age 17, M.A. in July 7, 1657. Rector of Melcombe Regis (now part of Weymouth, Dorset) by committee, September 24, 1646. Rector of Bettiscombe, Dorset, March 28, 1648. Assistant to Somerset Commission December 10, 1657. Preaching illegally in Thurlbear and five other parishes. Licenced at Broadway May 8, 1672. Living at Henlade in February 1674/75. Wife Katherine. I normally don’t include wills of ancestors’ children/uncles, but Rev. James will has special interest beyond the usual inheritances. Fed pigs, and put his wash in. From being with his God. By our author, and up rak’d. And was noe of his own. But he built on the sands. Did throw his own house down. Onely by men of note. during her pregnancy, or after giving birth to Melancthon? hardly have had any time to “break her heart” and die. mother’s death, instead of his own father and stepmother. [Nether Stronge] – The fictive place named Nether Stronge certainly sounds like a term of self-deprecation. I can imagine that Melancthon must have felt a certain degree of regret, self-pity, and resentment at having lost his mother to death, and at having been raised separately from the family of his natal father the Reverend James Stronge. [Cunnabula gentis] – Cunnabula gentis is a distinctly feminine expression in the feminine gender, so why would it not refer to the cradle of his maternal family? Cunnabula may literally mean simply ‘cradle’ but it says a lot more that that. It sounds like the type of word a man would be apt to remember from his college Latin course. There is little difference between high-brow courses, and pedestrian courseness. Places in Somerset, Dorset, and Devon What is your impression of the far-flung locations? There was obviously some connection between Batcombe, Somerset, and Battiscombe, Dorset. These two places named Batcombe happen to lie almost directly north and south of one another, in Somerset and Dorset, are both spelled the same. The Battiscombe you mentioned here must refer to the Battiscombe, Dorset, that lies to the southeast of Chard. The same interpersonal connections that once linked these places (Batcombe and Battiscombe), must have played some part in introducing James Stronge to Katherine Minterne. Satellite settlements were fairly common along the southern shores, for we see them in Kent and elsewhere throughout England. I presume that the Reverend James Stronge must have been living at the vicarage of Battiscombe, Dorset, in 1650, when Melancthon was born. However, if Katherine’s father was associated with Batcombe, Somerset, why was Melancthon born in Nether Stowey, far to the west? Was Nether Stowey the ancestral home of the Minterne family? 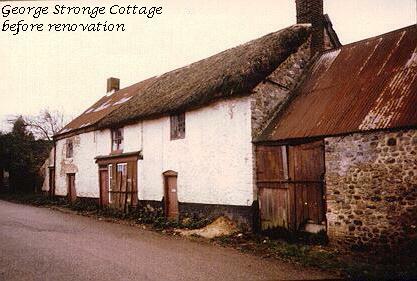 Did John Minterne and his wife Bridget Brown relocate from Batcombe to Nether Stowey? It is fairly interesting to see that Katherine was buried at Ruishton, Somerset, just about half way between Nether Stowey and neighborhood of Ilminster. It is likewise interesting to see that James’ youngest son Edward Stronge took up residence at Ruishton, Somerset. Ultimogeniture was a very odd practice in England, but it had existed in Kent from very ancient times. The only times when the English ever resorted to ultimogeniture were times of wholesale migration, such as during the early colonial period in America, or the famines in Ireland. (1)Melancthon was the ulterior sibling, belonging to Katherine Minterne instead of Sarah. The story certainly implies that Sarah simply declined to raise Melancthon with stepmotherly affections. In those days, the marriageform would have depended upon the father of the bride, so he might have made it part of the marriage contract and a condition of dowry. It seems reasonable to surmise that Melancthon’s upbringing at Nether Stowey might have been motivated by the prospect he might inherit his natal mother’s portion of whatever the Minterne and Strong families deemed to grant him in his mother’s right. Melancthon’s natal father James Stronge probably thought it was perfectly reasonable to separate his eldest son from the rest. His eldest son could simply enjoy his mother’s matrimony. 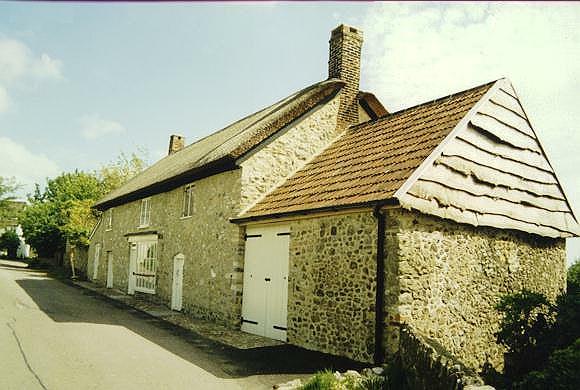 It probably was more convenient for James, and more acceptable to his new bride Sarah, to start anew their younger family in the southern towns of Battiscombe, Dorset, and Iminster, Somerset. (2) Rev. Martin Stronge was a cleric, and therefore could expect to have his livings thereafter provided by the church. Thus, it was probably reasonable to both Rev. James Stronge and his second son Martin that he should accept religious emoluments, allowing any inheritance to bypass him. (3)James Stronge junior sounds like the Prodigal Son. Have you compared the words “be living and returned” to the text of the King James Bible? Perhaps James junior left for America, but perhaps he was just indignant, and left his father’s house for a time. He could have eventually returned to his father, in either case. The eldest son Melancthon had his mother’s rightful matrimony, the second son Martin had tithing for his support, and the third son James was next in line. His father might have pegged plenty of hope upon his third son James, for his words want to tell us some deeper story. Naming the third son after his father was a custom typical of the English, Scots, and Welsh, during the eighteenth and nineteenth centuries. The custom might characterize the special fondness a father would customarily reserve for his third son, anticipating that his eldest son and second son would probably both go away for adventure, military service, or the priesthood, or even for emigration. (4) Edward Stronge apparently succeeded to whatever patrimonial rights remained at Ruishton, Somerset, by default. If James senior buried his first wife at Ruishton, then he must have had some prior attachment to that place. Melancthon must have felt a certain longing for his Cunnabula gentis, but his place name Nether Stronge, for Nether Stowey, would seem to speak more of his longing for the natal father he never had the chance to really know. Perhaps his maternal grandfather was too old and reclusive to play the role of his surrogate father, and he used the name Nether Stronge to allude to his alienation from his natal father. The sacrifice of Melancthonto the Minterne family must have made sense, in view of succession. Whether James junior’s new father-in-law had any influence in the matter would be anybody’s guess. I would suppose that James senior would have agreed to alienate his eldest son from the sibship that would inherit from his new bride. The story the Ballad tells is surely replete with interesting, but sad detail. 5. Henry Mynterne m. Briget Keymer, dau. I. John Brown of Frampton m. Thomazine Wareham, of Compton Valence, dau. of John Wareham. These two families were in the Visitations and had knighthoods and money. Notice the name Speake here and in the write up on Rev. James at Ilminster. It would seem that is how he met Katherine and also seem that this is where he had the influence of Katherine’s family. They were powerfull enough. Taking your first point – the trouble Katheine had, notice the date of Ilminster 1654. At that time Cromwell was in power. 1660 Charles II was restored to the throne and Rev. James had definately been doing well under Cromwell. We also know from his will that not all his and Katherine’s children lived and are buried with her. Patricia Pierce searched the records but, there was no mention of any of them. We also know he was at Ruishton before Curry Rivall, but that Parish doesn’t claim him and we couldn’t get the details. I don’t think Chardstock was to happy with him either because he is not listed under the list of Vicars but in other documents. We have no record of the birth of Melancthon anywhere. Don’t forget Rev. James liked to throw baptismal fonts and feed the live stock in them, of course, by the time Martin was born he had changed sides again. There was a date of 1650 in Burke Landed Gentry, but we have no idea where it came from and can’t prove it. Burke also had George Stronge wrong because he only had two of the sons, Thomas and Walter. I think you will find the ditty means that Rev. James Stronge was not a nice person and hard to live with. I’m sure Melancthon was raised by his father, remember that he was involved with the Duke of Monmouth and Rev. James had preached a sermon for the Duke. He probably had his mother’s family help escape any consequences. In wills of this time period “living and returned” is often used and always means the son has gone off somewhere on an adventure or even to sea where the father would not have any idea if he lived. Where Rev. James left him 100 pounds it may mean he had no need of material goods. (Note: BoB could you foward that write up I did on Sir. Edward Phelips to John). There is another curious thing about this family. Thomas Stronge d. 1663 not according to Church rite, but his son was a minister? One thing is for sure Rev. James Stronge took good care of himself. Throwing his mentor out and later changing with the political tide. 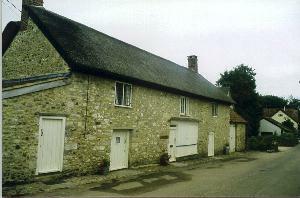 Nether Stowey was not the ancestral home of the Minterne or Browne family and they never moved there. The names of the grandchildren sure make it look like Katherine is the mother not Sarah. Rev. Marting Stronge of Yeovil, was there 30 years and well respected. There is a coat of arms in the church that is quartered with the Martin family, although we don’t know how he got it or if it was just made up. Rev. James Stronge and Katherine Minterne were related either by blood or marriage to Rev. John Warham, Windsor, Ct., Rev. John Stoughton, whose brother Thomas Stoughton [son of our ancestor Thomas STOUGHTON] came over, Rev. Walter Newburgh (Newberry) related to Thomas Newberry Elder John Strong and Vincent Meigs. Those are just the obvious ones. That Captain James Stronge need lookin into especially with the Phelips connection. This entry was posted in 12th Generation, Artistic Representation, College Graduate, Historical Site, Line - Miller and tagged Bloody Assizes, Father of Immigrating Brothers. Bookmark the permalink.